"EXPEDIA CARES ISN'T A CHARITY. IT IS OUR RESPONSIBILITY AS A GLOBAL TRAVEL COMPANY." Our corporate social responsibility efforts are aligned with 8 of the 17 United Nations Sustainable Development Goals—initiatives that are focused on protecting the planet, providing quality education, advancing equality, and enabling a more tolerant, just, and peaceful world. Together our actions in these areas can literally change the lives of millions of people. We are working with our global partner, Mercy Corps, to make an immediate impact on these big issues. In more than 40 countries around the world, Mercy Corps puts bold solutions into action – helping people triumph over adversity and build stronger communities from within. Together, we believe a better world is possible. Our employees are always inspiring us to do more. That's why we support them in four purposeful ways, ensuring a positive and lasting impact for all. We’re humbled by our team’s passion for individual giving and volunteering. That’s why we honor their commitment by matching donations and the value of the time they volunteered–to reinforce their significant efforts and support the organizations they care about most. Grassroots volunteer efforts contribute to the unique community cultivated at Expedia. Our initiative, innovation, and compassion aren’t just reserved for work, they extend into all aspects of our lives. That’s why many locations have employee-driven committees that source, plan, and staff local volunteer opportunities, benefiting a variety of local causes. Often called “the coolest field trip ever,” this program takes Expedians to a challenged destination, immersing them in the local culture to understand how we can help support tourism and sustainable living in the area. The impact of these journeys is long-lasting, breaking down barriers, and unveiling new possibilities for how we can impact the world together. “Corporate Social Responsibility” can be an abstract concept. 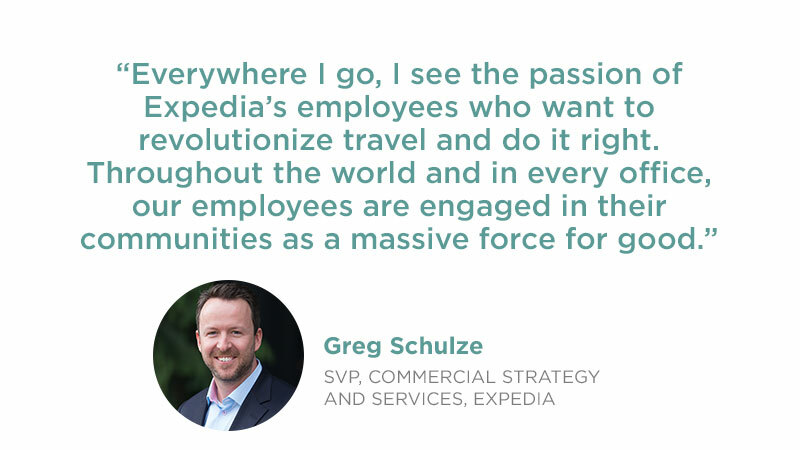 But at Expedia it’s real people—your colleagues and friends—making a difference every day.